Nice article and good insight. But, i believe the 2002 NPL% you are using are too conservative given the way they classified the NPL. To be more conservative, you should be looking at 2.0~3.0 times that figures. 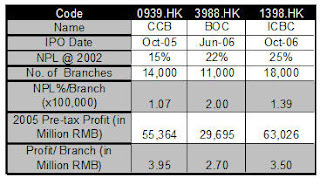 Anyway, from my personal experience, 3968 is still by far the best commercial bank in China. And within 3~5 years, i believe the foreign banks (especially HSBC) will be a major threat to all the domestic china banks. the NPL numbers I used are from official sources and most likely they under reported the real situation, still it served my purpose to obtain a relative picture among the banks.